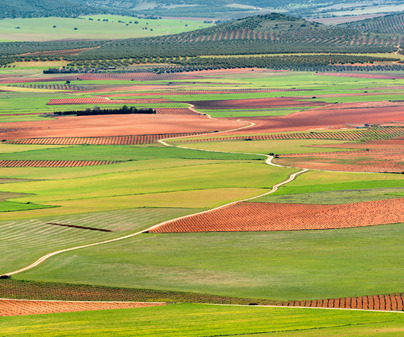 The pages of El Quijote have contributed to a universal understanding of the towns and countryside of this region. Throughout his intense and adventurous life, the writer had a connection with different places in this area. Toledo, Esquivias and Argamasilla de Alba were decisive places in his life. 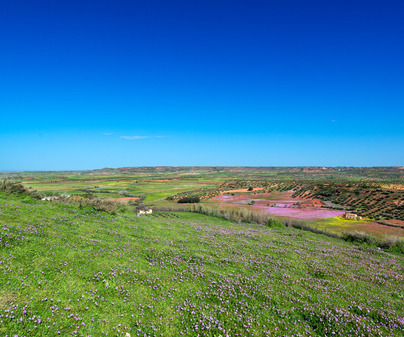 Follow in his footsteps, and venture to discover the charms of the Cervantine corners to be found in Castile - La Mancha, an essential part of our cultural heritage. The Esquivias parish church is dedicated to Our Lady of the Assumption. Here, on the 12th of December, 1584, Cervantes married doña Catalina de Salazar y Palacios, a local of the town. The church preserves in the sacristy the Book of Matrimony, where the union is documented. 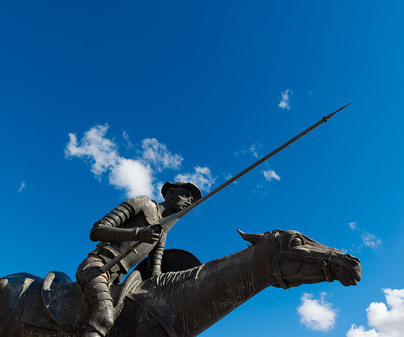 Catalina was the niece of the nobleman Alonso Quijada Salazar, who some historians believe to have been the inspiration for the immortal literary hero, Don Quijote. 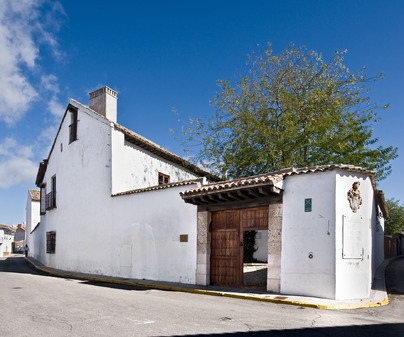 In a large house typical of the 16th century, the House Museum of Cervantes opens its doors in Esquivias. 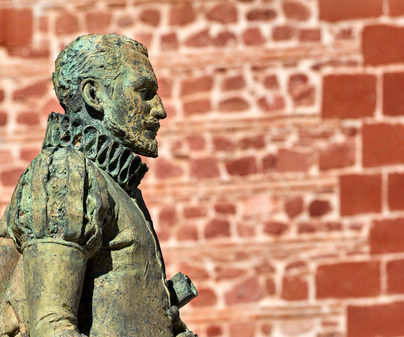 Here, you can learn details about the relationships between Cervantes and this town. 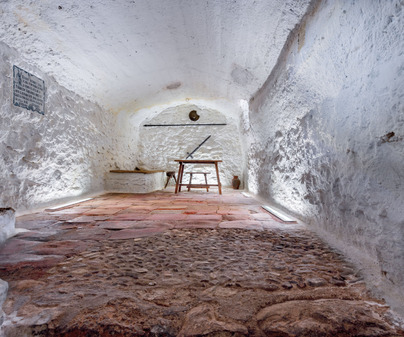 Enjoy the traditional arrangement that these rooms evoke, including a typical cellar. 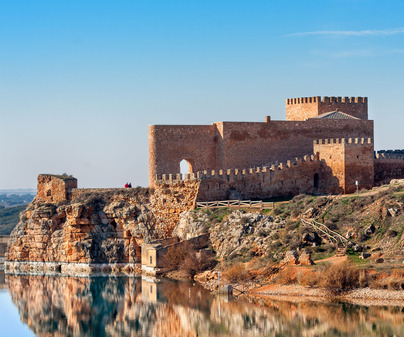 The wines from this corner of the Toledo province have always been very well appreciated; so much so that in the time of Cervantes they were reserved for the Royal House and for nobility, even being prescribed as a medicinal remedy for ailments and childbirth. Close to Esquivias is Illescas. This city was favored by Cardinal Cisneros, in whose Charity hospital you can admire up to five works by El Greco. Also, in the Plaza de Infanzones you can enjoy the shade of the many-times-centenarian Elm, just as the author of El Quijote used to do. 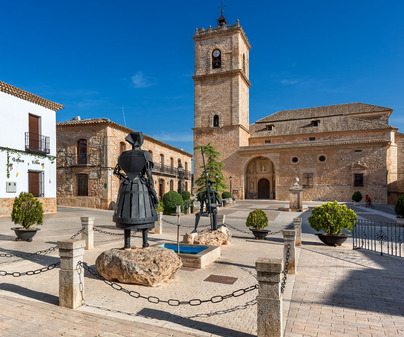 As the capital of La Sagra, the city holds a rich historical and cultural heritage. This was an obligatory stop for don Miguel on his numerous trips from Esquivias to Toledo and Madrid. Cervantes and his wife also had a house in Toledo. It was located in the Andaque neighborhood, close to the shores of the Tagus River, where ages ago the Arab tanneries used to be. Explore Toledo’s labyrinthine streets, looking for the spirit of Don Miguel, who spent many different periods of his life in here. In this city, he observed and dealt with merchants, gentlemen, soldiers, clergymen, and swindlers. He took note of all of them, leaving their presence for us in his works like La ilustre fregona (The Illustrious Kitchen Maid), La Galatea, Rinconete and Cortadillo, La fuerza de la sangre (The Power of Blood), Los trabajos de Persiles y Segismunda (The Works of Persiles and Sigismunda), Viaje del Parnaso (Journey to Parnassus), and of course, El Quijote. 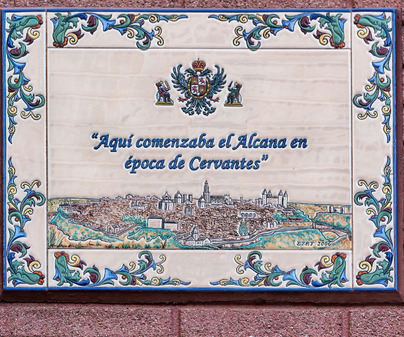 In the pages of his most renowned novel, Cervantes tells us that, passing one day through the Alcaná of Toledo, the commercial area surrounding the Cathedral, the narrator bought some papers with Arabic characters, upon which the story of our singular gentleman of La Mancha was written. Four centuries later, these same streets maintain the same hustle and bustle. 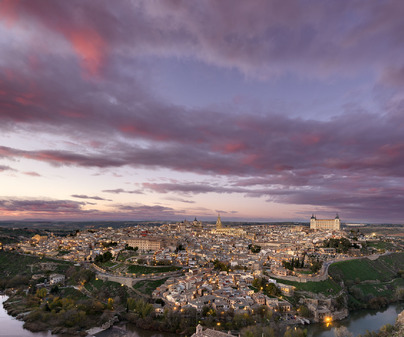 Take a stroll through them, together with the thousands of visitors that come to Toledo every day, and then head towards the Plaza de Zocodover. 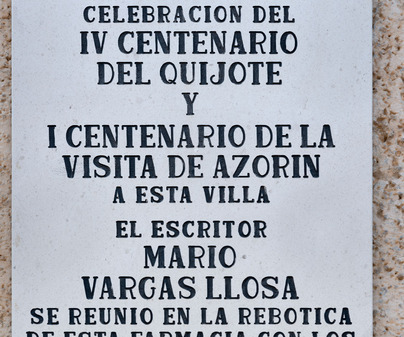 On the backs of the stone benches, you will see, in traditional ceramic tiles, recreated scenes from El Quijote. 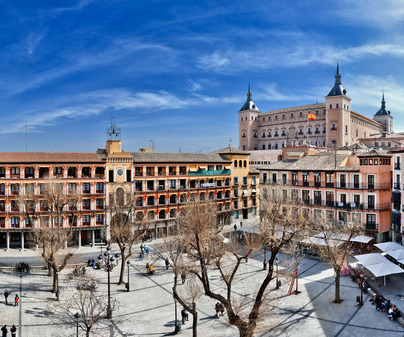 The Zocodover is Toledo’s main square. Its urban space preserves the characteristics of the urban areas unique to Castile, highlighted by the portals supported by granite columns. 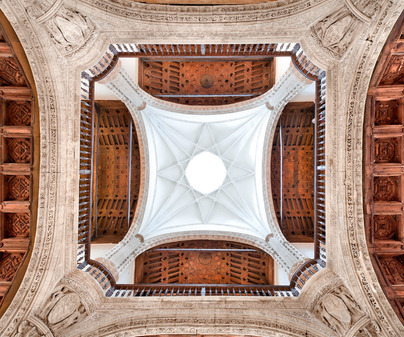 Locate the clock and look towards the Arco de la Sangre (Blood Arch) and go down the stairs. Here at the bottom of the stairs, Don Miguel waits for you. Take a picture next to his statue and continue going down the street that bears his name. You will pass by the Santa Cruz Museum, where you can see the great banner of the Battle of Lepanto, in which the writer’s hand was wounded. The pendant was given to the Cathedral of Toledo by don Juan de Austria after the victory over the Turkish fleet. Continue walking towards the building with the number thirteen. Here was the famous Posada del Sevillano, where Cervantes set the scene for La ilustre fregona. 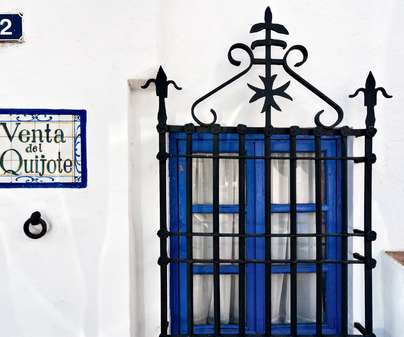 In other pages of his works, don Miguel mentioned it as one of the best and most frequented inns in Toledo. On its facade, you can see a commemorative plaque perpetuating this Cervantine memory. You are now very close to the Tagus River. In Viaje del Parnaso,Cervantes said that its waters carried, instead of sand, grains of gold. Clearly, they were other, better times for this fluvial channel that, despite everything, still embraces the stony promontory upon which Toledo stands. From the Paseo del Carmen you will see remains of the famous Artificio de Juanelo, which, in the pages of La ilustre fregona, was noted as being one of the greatest attractions of the Imperial City. 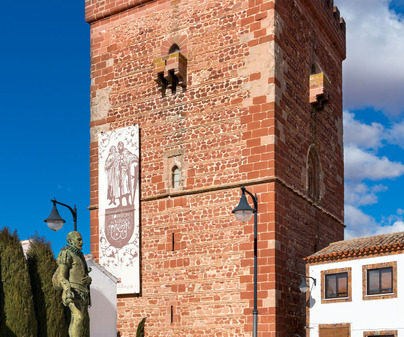 Without leaving the province of Toledo, you can visit Madridejos and Tembleque, both places with numerous Cervantine references. 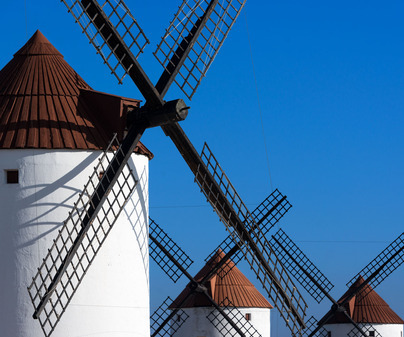 In Madridejos they celebrate El Quijote Conferences every year, and you can find the famous Molino del Tío Genaro, one of the few examples of the windmills that remain from the time in which Cervantes wrote El Quijote. 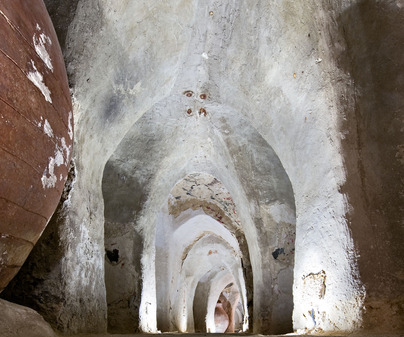 Its structure and machinery are preserved intact. 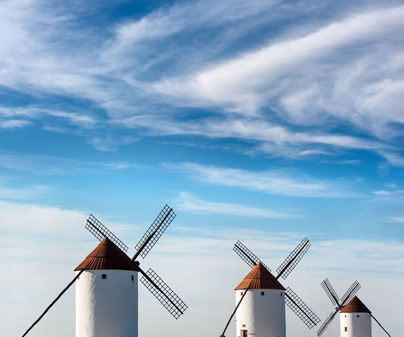 In these lands, the memory of Cervantes is present in each one of the manchegan towns where you see a windmill standing, such as in Campo de Criptana, Alcázar de San Juan, Consuegra or Mota del Cuervo. In Consuegra, they rise up along the Cerro Calderico, and in Monta del Cuervo you will spy them on the Balcón de La Mancha. In both places, you can perfectly imagine the description of the battle against the giants, the pure essence of the ideal embodied by both the character and the author, whose eventful life was at each moment a constant battle against apparently immovable giants. 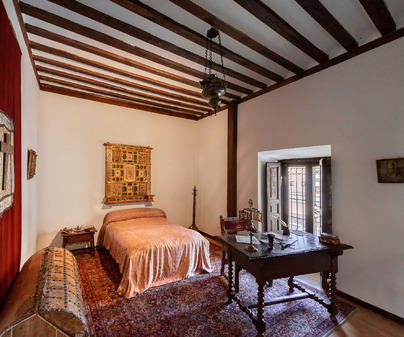 You shouldn’t leave Argamasilla without visiting the house of the Scholar Sansón Carrasco, the character who, with the priest and barber, was determined to return sense and sanity to don Alonso Quijano. 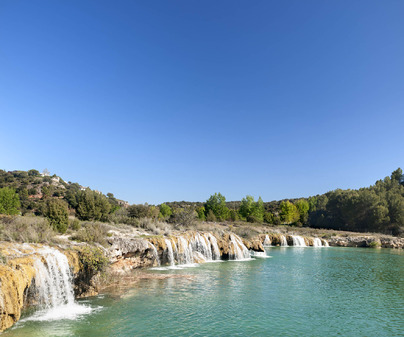 Nearby is the , from where you should go to the Natural Park of las Lagunas de Ruidera, one of the environmental and touristic jewels of Castile - La Mancha. Its beauty and mystery were reflected in the pages ofEl Quijote.Next, go down to the Cave of Montesinos and dare to defy the enchantments of the wizard, Merlin. Manzanares, they say, is where a goat herder told the Knight of the Sad Figure the story of Marcela, the beautiful and evil shepherdess. 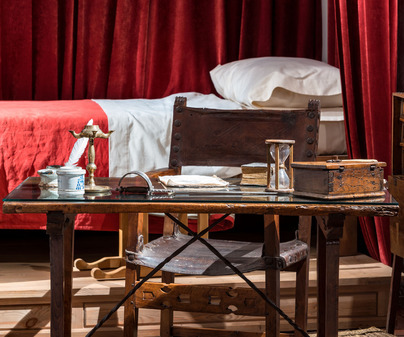 A story that without a doubt, don Miguel would have gathered from this area in order to recreate it in his novel, just as he recreated the burning of the books of the Marquis de Villena’s library in Belmonte in the famous purging of Don Quijote’s library. Also nearby is the Monastery of Uclés, a necessary visit to the heart of the Order of Saint James. 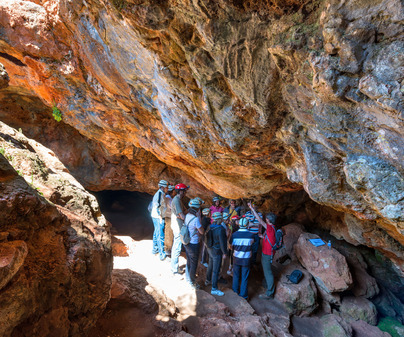 Further south is the site where the famous shout of “voto a Rus” originated, the hermitage of the Virgin of Rus, in the noble and Renaissance town of San Clemente, from where you can get to know the Cuenca and Albacete areas of La Mancha. 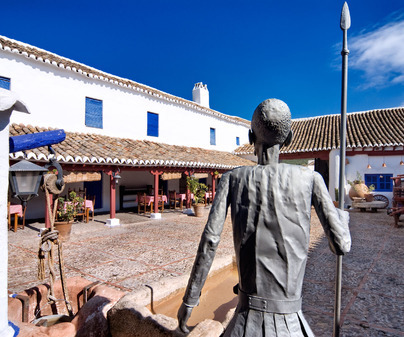 It is also essential to visit El Toboso, the birthplace of the incomparable Dulcinea, with its whitewashed facades, where you can still find “Dulcinea’s House”. 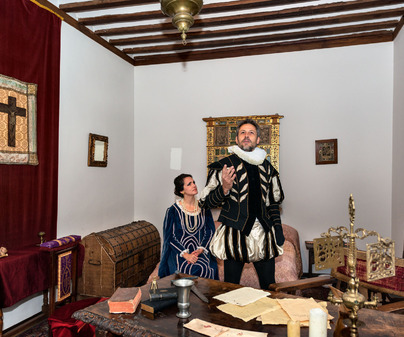 Here, in the House-Museum of Doña Ana Martínez Zarco, they also show what a manchegan house was like at the time of Cervantes. The parish church is the site of the saying “con la iglesia hemos topado” (a phrase from the novel, loosely translated as having come up against some powerful forces and defeated). Enter further a bit into the fields of Montiel, where the nobleman experienced some of his most fabulous exploits. And go to the inns and old paradors on the road towards Andalusia, like those preserved in Puerto Lápice. 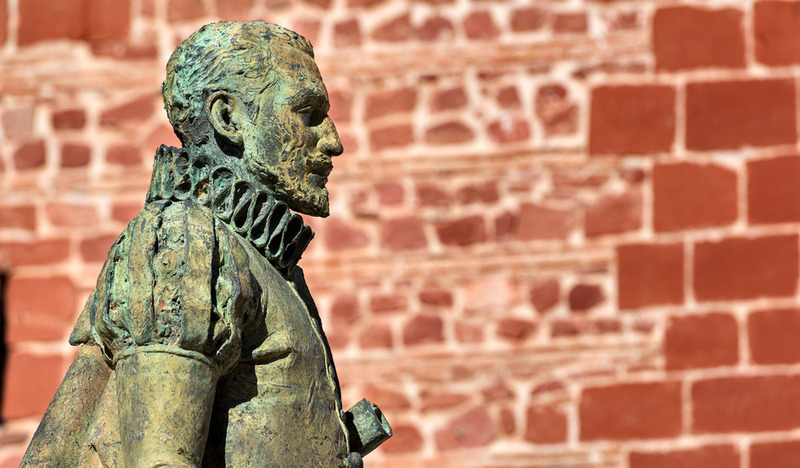 And to the noble town Almagro, where the performances of Cervantes’ theatrical works transmit a charm and special emotion in the Open Air Theater. And of course, Villanueva de los Infantes, the geographical center of Campo de Montiel, which contends to be the homeland of Alonso Quijano. “He who reads a lot and walks a lot, sees a lot and knows a lot”,don Miguel wrote. Follow his advice; enjoy his magistral literary work and, with it, Castile - La Mancha as well. It is impressive how much there is to see, know and experience.